When Dr. Mike was in college, he was sidelined by a shoulder injury sustained while playing football. After nearly a year in pain and multiple MRIs later, orthopedists recommended surgery to discover what exactly was going on. Dr. Mike, however, wanted an answer as to what could be done to fix him before he went under the knife. When doctors couldn’t provide him with the answer he was looking for, he discovered chiropractic. Though Dr. Mike had originally planned on becoming an orthopedic surgeon, he found the natural, no surgery philosophy around chiropractic to suit him much better. Experience with his own injuries has given Dr. Mike great insight into what patients are going through, how pain affects their lives and how important it is that each individual receives a customized plan of care. 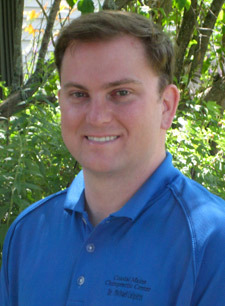 After changing his path, Dr. Mike attended Palmer College of Chiropractic in Port Orange, Florida, graduating in 2006. He then had the privilege of practicing in a small, quaint coastal town in Maine. Though proud of his practice and the wonderful relationships he formed with patients, as John Muir said, “The mountains are calling and I must go.” Dr. Mike moved back to the area he grew up in, opening a practice in Truckee. Today, Dr. Mike has a chance to share our beautiful community with his family, including his wife Holly and daughters, Chloe and Piper. They enjoy outdoor activities such as biking and skiing, with his daughters being members of a local ski team. Dr. Mike also enjoys activities like waterskiing, rock climbing, road or mountain biking and CrossFit. Dr. Mike is the secretary of the board for SORSI, or Sacro Occipital Research Society International, which is the governing body of the SOT® Methods. He first encountered this technique in chiropractic college when he hurt his lower back. Right away, Dr. Mike recognized that the individual approach this method offered would bring his patients whole-body, holistic healing. Because of this, Dr. Mike became a certified SOT® doctor. Additionally, he has over 400 class hours in pediatric and pregnancy chiropractic care. We’re here to help your entire family reach greater levels of wellness. Contact our practice today and find out what we can do for you!